Breaking ground for Central Presbyterian’s new building. From left: Bosa Properties CEO Colin Bosa, board of trustees chair Gillan Jackson, Vancouver Centre MP Hedy Fry, Rev. Jim Smith, and architect Gregory Henriquez. Photo by Frank Stirk. With the redevelopment of the Central Presbyterian Church site at Thurlow and Pendrell streets in the West End finally underway, Rev. Jim Smith – who’s been shepherding this project since its inception six years ago – can finally breathe a sigh of relief. 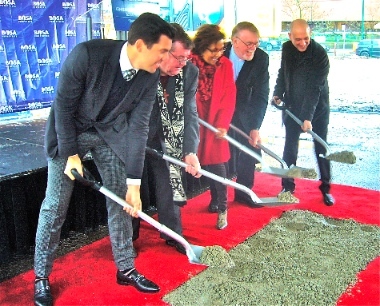 A ground-breaking ceremony to officially mark the start of construction took place February 12. On hand were representatives of Bosa Properties (the project manager), architect Gregory Henriquez and Vancouver Centre MP Hedy Fry. This tower, including space for Central Presbyterian Church, is due to be completed in 2018. 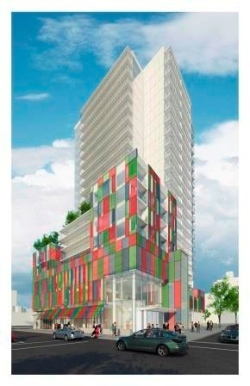 When construction is completed two years from now, a 22-storey multi-use building will occupy the site. Central will move into a three-storey podium along with a daycare, various community facilities and commercial retail space. Above the podium will be a tower containing 168 market rental units. Bosa will use the revenues from these units to fund 42 social-housing units for seniors that the church – the project developer – will oversee through a non-profit housing society. The project will be entirely self-funded. 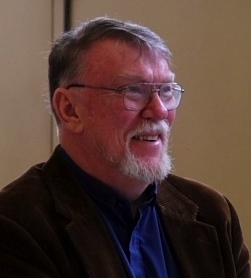 Faced with an aging structure well past its prime, Smith says his congregation and the other two that share the space – Galilee Korean Presbyterian Church and Christ Alive Community Church – agreed that some radical action was needed. Rev. Jim Smith says the old church building was no longer able to meet all the demands placed upon it. “We’re very active on a whole bunch of things – a daycare, a Montessori school, food bank, AA group, karate class, community meetings, voting station, seniors’ roundtable – and we were out of time and space,” he says. Since November, Central’s 60 or so members have been meeting Sundays at the Sands Best Western Hotel on Davie Street – and “as we expected,” Smith says, their attendance has grown. The old church building was torn down in January. 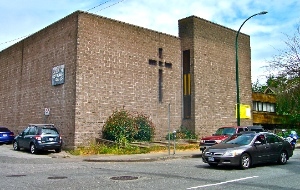 This is Bosa’s third church-based redevelopment project, the others involving Christ the King Lutheran Church in Surrey and Catholic church property in Victoria. Senior vice president Daryl Simpson says the key to getting a project like this off the ground is a high level of trust in his company’s ability to make it happen. “It’s a relatively intimidating idea that you’re going to build this high-rise tower and a brand new church and the millions of dollars that are part of upfront funding and ongoing support and the skills and expertise you need to do that,” he says. I have heard of people being questioned extensively on their religion and being rejected for this seniors residence if they don’t fit the church’s religious mold. Isn’t that a violation of basic human rights? I am sure there is no truth to those claims. The seniors residence is open to applicants from all backgrounds.